Seize a cooler moment in August or early September to plant fresh flowering plants. Chrysanthemums star in the fall color show, but don’t overlook pansies, violas and asters. Check out perennials such as the compact cultivar of boltonia, ‘Jim Crockett’, with showy purple flowers, or a sedum with purple, pink, green or white blooms. These plants bloom now, well past the first frosts. Plant from mid-August through mid- September. Frost-tolerant annuals include diascia, related to snapdragons, and perfect for hanging baskets. Calendula, snapdragon, and verbena pop with color. Flowering cabbage and kale, as well as ornamental grasses add texture, form and contrast to fall containers or garden beds. Even tender annuals, such as scarlet sage, zinnias, and cold-hardy petunias and their cousins – calibrachoa – stand a chance of blooming through October in sunny protected spots - on a porch, or close to the south side of a building. Their bright splashes of color light up the shorter days. As the days get shorter, places that were sunny might get more shade. Look for 6 hours of sun for fall flowers. The sun encourages blooming in cool weather and dries out wet soil after fall rains. To rejuvenate containers, remove the plant material, including the roots. Add fresh potting soil before installing mums or hardy annuals. Apply water-soluble fertilizer at planting, and for a few weeks thereafter. In garden beds, remove unwanted plants. Turn the soil to loosen before planting. Incorporate organic matter, such as 3” – 4” of compost or peat moss, and all-purpose fertilizer at the recommended rate. Plant mums, asters, grasses and flowering cabbages 18” – 24” apart; plant pansies and most other annuals 6” – 8” apart. Avoid further applications of fertilizer, which can stimulate new, frost-prone growth. Water the plants ½ hour before planting, then tap them out of the pots or packs. If the root ball is compacted, poke your thumbs into the root ball and gently wedge the roots apart about an inch to encourage the roots to extend into the new soil. For a large root mass, do this in a few places. Press the soil firmly around the roots to ensure good soil to root contact. Water with an all-purpose fertilizer solution to settle and moisten the soil around the roots. Plants need less water as temperatures drop. Water only when the top 1” of soil is dry to the touch. Cold, wet soil can lead to disease problems. Hardy chrysanthemums, pansies and other fall perennials can overwinter in well-drained soil, rich in organic matter. 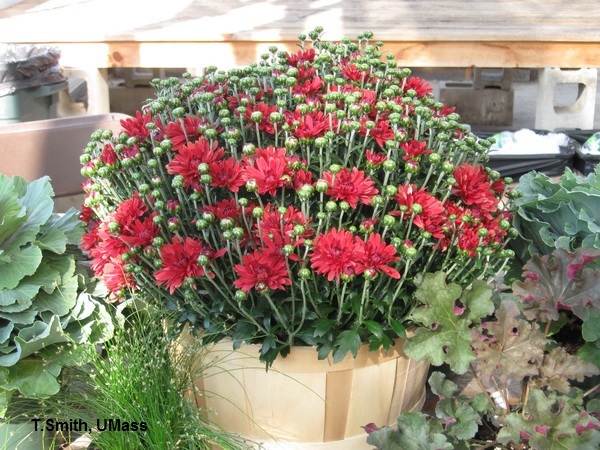 Keep in mind that not all cultivars of mums will overwinter in Massachusetts. To encourage overwintering, plant in September or earlier, mulch with evergreen branches or pine needles after the soil freezes to prevent alternate freezing and thawing. Plants in containers will generally not overwinter. Combine mums with flowering kale and asters. Mums also look terrific with ornamental grasses.